This is Brad Hubbard's farmhouse on 162 Houghton Road in Princeton. I did this painting (the first of probably three or four) for the Farm/Art Day in September. Brad's farm used to be a Dairy farm but is not a working farm anymore. It is however a magnificent relic of New Englands past. Take a look at the Princeton Arts Society's website for all the details. I am so much looking forward to my exhibit in Tatnuck this coming September 17th. People have been wanting to see their portraits or others that will be shown. Just to give in a little bit I've decided to show the portrait of my friend, Judy Tonelli-Brown. She is a graphic artist and does portraits as well. Have a look at Judy's site. T.H. Benton's "People of Chilmark"
One of the challenges of this past year was the painting of a full-size (65x77 inches or 166x197cm) copy of Thomas Hart Benton's People of Chilmark. I first of all had to make a frame for such a large canvas. I had some help from my friend John with this. Then I sketched the "big picture" with charcoal and started with an under-painting in acrylic. Then while over-painting with oils I got into detail.... It was in this stage that the shadows and brilliant colors came together. During this process I learned much about T.H. Benton. I wish I had the opportunity to get to Washington to see the real painting up close to get a better feel for the brush strokes. I signed the painting "After Benton by Elisabeth"
To get the painting out of my studio we had to remove it from the frame and roll it up.... scary stuff! We then dismantled the frame itself and boxed the whole deal up and shipped across country to the client in L.A. I was all together satisfied...... the client just loved it. 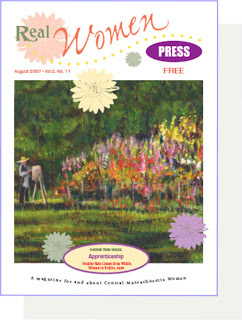 By the way..... the painting is of my garden in 2005. More than 30 of my portraits will be featured in a one-woman art exhibit entitled People of Tatnuck. As a Tatnuck artist, I have undertaken to capture many of the colorful people who help make this Worcester neighborhood so closely knit. My artistic motivation is neither recognition nor profit, but rather to present a colorful record of the people and merchants that make the neighborhood such a pleasant place to live and shop. I have been working in this project since March of 2007. This exhibit is meant as a contribution to the spirit that makes the neighborhood the place it is today, with its variety of shops, services and the personalities that own or operate them. With the closing of the exhibit I will joyfully donate the portraits to the subjects. Biography: I was born Elisabeth Johanna Herweijer on February 24, 1942 in Hilversum, the Netherlands. As a child my artistic development was encouraged by private art lessons in drawing and painting. After middle school I studied fashion design in Amsterdam and worked in a animation studio in Hilversum for Polygon. In 1963 I traveled to the United States (Worcester, Massachusetts) to work as an au pair. During this time I met Pieter Paul Donker, a dutch journalist working for the Worcester Telegram and Gazette. We were married on May 16, 1964 and have two children Coert Henri (1965) and Cornalijn (1966). 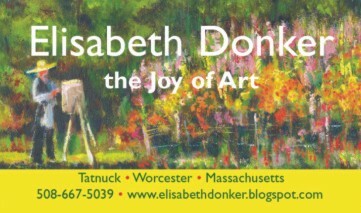 We currently reside on our farm outside of Worcester, where I do my best to work daily in my studio. Artwork: My experience up to 1978 was focused on stained glass; learning techniques and later teaching. 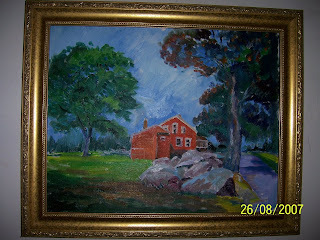 I did my oil painting primarily during vacations on Cape Cod. In June of 1978 we were lucky enough to buy the North Bend Farm, in the Tatnuck area of Worcester. It was here that I became interested in wool fiber. With much hard work we rejuvenated the run down farm and started sheep and Angora goat farming. Between spinning, weaving and knitting I also gave educational tours for local schoolchildren and daycare groups. During these years the oil painting was again in the background. In 1988 I started painting on ceramic tiles and mugs. These quickly became too small for my designs so I moved on to plates and bowls..... and bought a kiln. After extensive research in Europe I registered a trademark, Worcesterware and started producing complete services and commemorative plates. My work has been presented to former First Ladies Barbara Bush and Hillary Clinton. In the meantime I also did ceramic repairs and restorations. As Worcesterware became more business oriented I, as an artist, began to lose interest. I slowed down and eventually stopped the commercial operation and once again started oil painting. On my 60th birthday in 2002 I decided to retire. 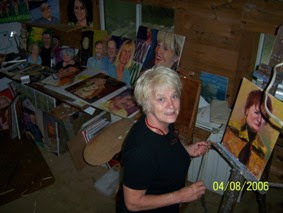 Since then I have devoted my time to painting, mostly in my studio or garden. I also enjoy painting with the Princeton Art Society and periodically volunteer time as an art teacher at a local rest home. Occasionally I accept commissions for portraits or other works.